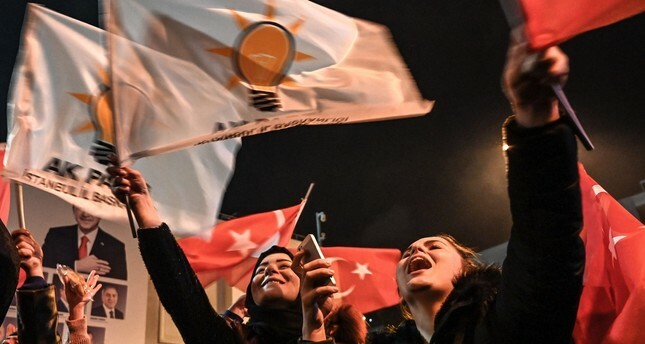 Supporters of the Justice and Development Party (AK Party) wave Turkish national and party flags as they celebrate local election results near AK Party headquarters in Istanbul, March 31, 2019. "I am the mayor of Istanbul Metropolitan Municipality," the main opposition Republican People's Party (CHP) candidate Ekrem İmamoğlu has been saying, despite the votes in Istanbul undergoing a recount as per the post-election legal processes, carried out by Turkey's Supreme Election Council (YSK). İmamoğlu's eagerness and rushed conclusion, however, has been the talk of the town, and mocked by many, as the YSK has not declared him a winner. Social media accounts have been flooded with users sarcastically claiming to be "the mayor of Istanbul" in their bios on Twitter, following İmamoğlu changing his bio on Twitter to the "mayor of Istanbul." Unsatisfied with a change of bio on Twitter, the CHP candidate also visited Anıtkabir, the mausoleum of Mustafa Kemal Atatürk, the founder of Turkey and its first president, where İmamoğlu signed the memorial book as the mayor of Istanbul. The unforeseen rush to sign the memorial book was not welcomed by the National Defense Ministry and other military officials who described the move as irregular conduct. While in many provinces election results have been smooth, in Istanbul the case is not the same. There have been reports of irregularities and suspiciously missing votes by the parties, leading to a recount of invalid votes in 15 of 39 districts and a recount of all votes in three districts, according to city and district electoral councils. Among the districts of Istanbul, the AK Party took the rule in 24 district municipalities, which cover 62 percent of the population in Istanbul. While the CHP led the polls in 14 districts, one district will be ruled by the MHP. However, the unofficial results showed İmamoğlu leading in the mayoral race for the mayor in Istanbul Metropolitan Municipality against AK Party candidate Binali Yıldırım, who was deemed to be the favorite by many in the race ahead of the elections, by a small margin of about 22,000 votes. In total there were 10,570,939 eligible voters and voter turnout was 83.88 percent. However, out of nearly 9 million voters, 319,540 were decided invalid votes, which are found to be mainly in districts considered to be AK Party strongholds. Ekrem Imamoğlu, the Republican People's Party (CHP) mayoral candidate for Istanbul, speaks at during a press conference after the local elections in Istanbul, March 31, 2019. The recounting process for Istanbul votes following the appeals is currently underway and the ultimate decision for the winner will be declared by the YSK, a non-partisan and independent body. The 15 districts where invalid votes are being reexamined are Küçükçekmece, Beyoğlu, Başakşehir, Maltepe, Büyükçekmece, Çekmeköy, Eyüp, Fatih, Tuzla, Sarıyer, Ataşehir, Beykoz, Şile, Bayrampaşa and Ümraniye. Meantime, all the votes are being recounted in the western Çatalca and Silivri districts and the eastern Kartal district. Speaking at a press conference on late Wednesday, the ruling Justice and Development (AK) Party's Istanbul mayoral candidate Binali Yıldırım called on his rival to be patient for just a few days and wait for the official results. In a rather humorous tone, Yıldırım called on his rival to be patient for a few more "sleeps" untill the official results are declared by the YSK. "We will sleep and then wake up, we will sleep and then wake up, we will sleep and then wake up. And we will find out the results," Yıldırım said. "I will safeguard these votes," Yıldırım added. "The election is over, however, the complaint and appeal period continues," Yıldırım said. "If it is your right, you will take this title. Then you can go wherever you like, if you like you can go to Sultanahmet [Blue Mosque Square] and scream 'I have become a mayor', who can say anything then?," Yıldırım said. "Signing the book in Anıtkabir as the mayor of Istanbul is a shock move, I am not saying anything else," AK Party candidate also added. Recep Özel, the AK Party's representative in YSK, informed early yesterday that the gap between two parties have dropped to 19.000 votes from over 20,000 difference as the reassessment process of votes was still ongoing. Millions of Turkish voters cast their votes nationwide in the local elections to choose Turkey's mayors, city council members, mukhtars (neighborhood officials), and members of elder councils for the next five years. According to unofficial results, the AK Party is leading in 15 out of 30 metropolitan municipalities (larger cities) and 24 out of 51 smaller cities across the country. Meanwhile, a reassessment of invalid votes in 10 districts of capital Ankara is still continuing, while all votes are being reassessed in the district of Polatlı. Mansur Yavaş, CHP's mayoral candidate in capital Ankara, is leading with 50.93 percent of votes, according to unofficial results, with the AK Party's Mehmet Özhaseki at 47.12 percent.